Particulate matter, microorganisms in air and environmental conditions present a potential risk to museum collections. There are also limited studies of simultaneous measurements of airborne particles and microorganisms inside museums and the effects of seasonal variations. Therefore, extensive indoor/outdoor measurements of particulate matter mass/number concentrations and viable, cultivable microbial load were performed in two museums and a library in Greece for a period of 2 years at selected time intervals. The culture heritage collections are located at coastal (Historical Museum of Crete in Heraklion), urban (Criminology Museum of the University of Athens) and mountainous (Neophytos Doukas Library in Zagori) environments and their collections consist mainly of organic materials. Measurements of inhalable particulate mass (PM10, PM2.5, PM1) and viable, cultivable airborne microorganism concentrations (heterotrophic bacteria, cellulose metabolizing bacteria, acid producing bacteria and mesophilic fungi) in air were performed. The indoor PM10 and microbial concentrations were higher than the outdoor levels showing the influence of the indoor sources, such as the presence of people and indoor activities, as well as, anthropogenic outdoor sources, and natural emissions. Elevated PM1 particle number concentrations were also encountered in the Historical Museum of Crete in Heraklion and the Criminology Museum of the University of Athens due to the high anthropogenic emissions of the urban areas. The lowest concentrations of viable, cultivable airborne microorganisms were measured in the Historical Museum of Crete at the coastal site, which encounters also well controlled microclimatic conditions. In comparison to the other two naturally ventilated sites, the highest concentrations of viable, cultivable airborne fungi were measured in the Neophytos Doukas Library at the mountainous site, whereas the highest concentrations of viable, cultivable airborne heterotrophic bacteria were measured in the Criminology Museum of the University of Athens at an urban site, where mummified tissues and dry specimens are exhibited. The closed showcases of the two museums and the library could only protect the exhibits from viable, cultivable airborne fungi, but not from specific categories of bacteria. Acid producing bacteria in the Historical Museum of Crete, cellulose metabolizing bacteria in the Neophytos Doukas Library, and opportunistic pathogenic heterotrophic bacteria in the Criminology Museum of the University of Athens showed to be enriched inside the closed showcases. The indoor environment in museums is influenced by several factors, whereas the main influence arises from the environmental conditions (e.g. humidity, temperature, light), gaseous and particulate matter (PM) pollution, and microorganisms . Particulate matter is a potential threat to objects in the museums due to soiling and chemical reactions from harmful compounds inside the particles or on the surface between the particle and the deposited surface. The chemical composition of particles is an important factor which affects the preservation of objects inside museums [2–7]. Furthermore, the viable, cultivable microorganism load (bacteria and fungi) in the air inside museums has been identified as a major problem for the deterioration of cultural heritage objects . In particular, organic materials are very complex in structure and their deterioration is a complicated process. Besides the importance of thermal or photochemical induced oxidation process, ionic hydrolysis reactions and reactions induced by UV, there are several other factors which affect the deterioration of organic objects. Among them is humidity, temperature, particulate matter, microorganisms and gaseous pollutants (such as O3, NO2 or SO2). All the reactions create changes in the organic structure caused by alterations in the chemical bonding and may lead to a disintegration of an object [1, 4]. A number of studies have been performed to determine the characteristics and sources of particulate matter and airborne microorganisms inside museums [2, 9–14]. The current study reports on particulate matter mass and number concentrations, viable, cultivable airborne microorganism concentrations, as well as, environmental conditions (infiltration rate, relative humidity, temperature) in two museums and a library in Greece for a period of 2 years. Additional measurements on PM size distribution and PM chemical composition analysis which were performed will be a subject of a future study. 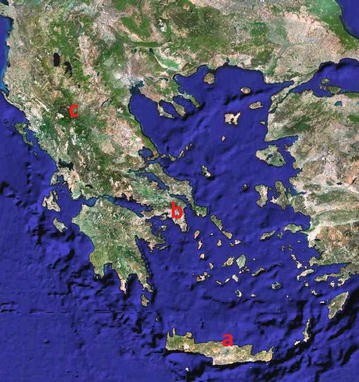 In the current study, the measurement field studies took place in two museums and a library in Greece, with a total duration of 2 years (March 2013–February 2015). Three cultural heritage collections with different exhibits and differences in relation to location, ventilation and number of visitors were selected (Fig. 1). These cultural heritage collections are: (1) the Historical Museum of Crete (http://www.historical-museum.gr/) (coastal environment, well controlled microclimatic conditions, high number of visitors), (2) the Criminology Museum of the University of Athens (http://www.criminology-museum.uoa.gr/) (urban environment, naturally ventilated and partially air conditioned, low number of visitors), and (3) the Neophytos Doukas Library (mountainous environment, naturally ventilated, no visitors) at Ano Pedina, Zagori (see Fig. 1). The exhibits in the museums consist mainly of organic materials (textile, leather skin, parchment, bones, wood, paper, etc.). The measurements in each museum occurred at three sites [outdoors (site A), indoors (site B) and inside showcases (site C)] in order to determine the indoor/outdoor relationships and the effectiveness of showcases in protecting organic exhibits. The Historical Museum of Crete is located close to the harbor of Heraklion and its distance from the sea is about 200 m. The test site is located on the second floor of the building. The Museum is housed in a neoclassical building and was founded in 1953. The building is consisted of 19 rooms and 2 court yards. The exhibits in the Museum are mainly composed of organic materials, such as paper, wood, silk, wool, cotton and paintings/panels. Site A is situated outdoor of the museum at a point behind the forefront of the building. Site B is situated inside an ethnographic exhibition room of organic materials, and the third site (site C) is inside of a showcase, which exhibits mainly wool and cotton materials. The museum has an independent mechanical ventilation system, controlled indoor conditions and a large number of visitors. The Criminology Museum of the University of Athens is situated in the centre of the town, in the region of Goudi at an altitude of 135 m. The museum is hosted in an air conditioned building, although the sampling room itself is not air conditioned. The lighting of the room is both natural and artificial, whereas the openings are partially covered with curtains. The exposed collection includes mainly organic materials, such as mummified tissues, bones, leather skin, textile, wood, paper, metal guns and knives. Measurements were performed at three sites. The first one (site A), is located outside the building, in the surroundings of the museum. The second one is located inside the museum (site B) in the centre of the exhibition room. The third site (site C) is located inside a showcase. The museum is open mainly for students from the Medical Faculty. The Neophytos Doukas Library, at Ano Pedina village of Zagori region at the Prefecture of Ioannina (rural and mountainous environment) is located in a sparsely populated remote area, at an altitude of about 1000 m. The museum is hosted in the old school of the village without any air conditioning and heating system. There are four windows without curtains so that the light can penetrate unhindered indoors. The exposed collection includes mainly organic materials, such as old books most aged 2–3 centuries. The books are made of materials such as paper, leather and thread. The measurements were performed into three different locations. Site A is located outdoors, site B is located indoors and site C inside a showcase filled with old books close to a window. The museum is open to the public after appointment. An extensive measurement campaign was conducted over a 2 years period including environmental parameters, gases, particulate matter and viable, cultivable airborne microorganisms (bioaerosol) sampling. In the current work the focus is on the particulate matter and bioaerosol measurement characteristics. The measurement schedule included a 2 days campaign every third month for each site to examine the seasonal variability influence for a period of 2 years. The PM10, PM2.5, PM1 particulate matter mass measurements in the museums were performed using the TSI’s on-line Dusttrak™ Aerosol Monitor model 8520, which is a portable, battery-operated, laser-photometer that measures continuously airborne dust concentrations (TSI 2003). A P-Trak (Ultrafine Particle Counter, Model 8525, TSI) instrument was used for the determination of the number concentration characteristics. The Dust Trak and Dust Trak II instruments are based on a 90° light scattering and have a particle size range from 0.1 to 10 µm at a flow rate of 1.7 L/min with a concentration range from 1 to 100,000 µg/m3 for Dust Trak, and a flow rate of 3.0 L/min with a concentration range from 1 to 150,000 µg/m3 for Dust Trak II, respectively. The log interval was set up to 1 min. The P-Trak uses high-purity isopropyl alcohol to grow microscopic particles for easier detection and counting in the optical chamber. Its concentration range is between 0 and 5 × 105 particles/cm3 and it is able to measure particle concentration in the size range from 0.02 to 1 µm at a sample air flow rate of 0.1 L/min. The Dusttrak™ instrument measurements were corrected based on the beta attenuation methodology. Comparative measurements of PM10 concentrations by the beta attenuation monitor (FH 62 SEQ) and the Dusttrak™ Aerosol Monitor model 8520 were performed at the background station for a period of 12 months. The correction formula can be expressed as: beta [Attenuation Monitor Concentration] (μg/m3) = 0.80 [Dusttrak Monitor Concentration] (μg/m3) + 10.4 . In addition, the MAS 100 one stage sampler was used to collect viable particles larger than 1.1 μm with a flow rate of 100 L/min and coincides with the level 5 of the Andersen sampler. The collected air volume by the MAS 100 sampler varied from 50 to 250 L. The referred air volumes of the collected samples using the MAS 100 sampler were optimized in experiments before, so that, for reliable results, the colony number per plate (90 mm diameter agar Petri dishes) not to exceed the number of 80. Each aluminum orifice stage was disinfected using wipes containing 70 % isopropyl alcohol between collections of different samples. The methodology of analysis for the viable, cultivable, airborne microorganisms is based on the cultivation of the air sampled microorganisms on specific microbiological growth media. The heterotrophic bacteria were cultivated in Tryptone Soy Broth (Merck, Germany) containing 1.5 % (w/v) Agar at 37 °C in the dark for 48 h. Incubation temperature of 37 °C was chosen for the determination of the airborne, heterochthonous (not indigenous to the area of present occurrence), opportunistic pathogenic, heterotrophic bacteria due to health-related interests. The cellulose metabolizing bacteria were cultivated in Tris Phosphate Mineral Medium  containing 1.5 % (w/v) Agar and 0.5 % (w/v) crystalline cellulose as sole carbon source at 37 °C in the dark for 8 days. The acid producing bacteria were cultivated in the Gluconobacter oxydans Medium  at 37 °C in the dark for 8 days. Acid producing bacteria were counted only when form clear zones below the colonies. In parallel, viable mesophilic fungi were cultivated in Malt Extract Broth (Lab M, England) containing 1.5 % (w/v) Agar at 20 °C in the dark for 72 h. Air samples were collected in two sequential repetitions on each specific growth medium in three locations of each museum and library (indoors, showcase, outdoor) using a single sampler. The counted number of colonies was precisely corrected using the positive hole conversion tables, supplied by the manufactures of the used sampling instruments. Concentrations of cultivable airborne microorganisms were expressed as colony forming units per cubic meter (CFU/m3). Measurements of environmental parameters indoor/outdoor (RH, T, infiltration rate) were performed at the two museums and the library to determine the indoor microclimate and the prevailing outdoor conditions during the different seasons. In order to measure the CO2 levels indoors/outdoors of each museum for the determination of the air exchange rate, the IAQ instrument (Indoor Air Quality Meter, Model 8762, TSI) was used which measures the CO2 level in parts per million (ppm). The log interval was set up to 1 min. The infiltration rate was computed by the indoor to outdoor CO2 concentration ratio. It was found that the average infiltration rates were 1.41, 1.22 and 1.15 h−1 in the Historical Museum of Crete in Heraklion, the Criminology Museum of the University of Athens and the Neophytos Doukas Library in Zagori, respectively. Data loggers of environmental conditions (temperature and relative humidity) were used indoors/outdoors in the museums under study. The air temperature and relative humidity were recorded continuously by three Tiny Tag data loggers in each museum placed on three locations (outdoors, indoors and in a showcase). The microclimate measurements showed that only at the Historical Museum of Crete the indoor conditions are well controlled since there is in operation a central air conditioning and heating system (average values: T = 21.9 ± 4.8 °C and RH = 54.2 ± 4.4 % for site A, T = 21.0 ± 2.5 °C and RH = 51.6 ± 4.4 % for site B, and T = 21.3 ± 2.4 and RH = 51.2 ± 5.4 % for site C). Contrary, in the other two museums the differences between outdoor/indoor values for the relative humidity are small indicating that the indoor conditions are not well controlled. The outdoor seasonal variation of temperature gives the same profile in all three museums, with the highest values during spring and summer, and the lowest during autumn and winter. More specifically, the average temperature values at the Neophytos Doukas Library at Zagori showed the lowest temperatures due to its high altitude location (average values: site A: T = 13.9 ± 7.2 °C; site B: T = 14.2 ± 6.5 °C; and site C: T = 14.2 ± 6.6 °C. The relative humidity values in the Neophytos Doukas Library in Zagori are also close to the outdoor values indicating not well controlled conditions (52.3 ± 9.3 % for site A, 52.3 ± 8.3 % for site B, 52.2 ± 8.1 % for site C). In comparison, the average temperatures and relative humidity values at the Criminology Museum of the University of Athens were for site A T = 20.2 ± 6.0 °C and RH = 51.5 ± 5.6 %, for site B 20.1 ± 5.6 °C and RH = 51.3 ± 5.1 %, and for site C 20.3 ± 5.9 °C and RH = 50.7 ± 5.6 %. Figure 2 shows the 2 years average mass concentrations of particulate matter in the different museums during the measurement campaigns using Dusttrak™ instruments. The measurements were performed for a period of 3 h at each site during the opening hours of the museums. The lowest particulate matter concentrations outdoors were observed at the Neophytos Doukas Library in Zagori which is located in a mountainous region at the north west of the Greek mainland, whereas the highest particle levels indoors are measured in the Criminology Museum of the University of Athens. The Athens museum is situated in a densely populated urban area (Goudi) with an extensive road network. In addition, the PM2.5 fraction in the PM10 mass is ranging from 0.7 to 0.9 in the sampling sites indicating also that particles indoors have a significant outdoor origin. The only exception was observed in site C at the Neophytos Doukas Library in Zagori with a value of 0.3 as a result of an individual measurement with extreme high concentration of PM10 (307 μg/m3) at the first measurement campaign. This result can be caused by coarse mineral and organic airborne dust found in the showcases. Furthermore, the average PM10 mass concentration indoors is higher than the outdoor levels for the museums with natural ventilation (Athens and Zagori) and close to the outdoor levels in the well controlled Historical Museum of Crete. This finding indicates that the presence of visitors (as will be shown also in Fig. 3) and indoor activities in the museums, as well as infiltration from the outdoor atmosphere (as will be shown also in Fig. 4) contribute to higher concentrations through particle resuspension and penetration. In addition, the well controlled microclimate conditions and the clean environment in the Historical Museum of Crete in Heraklion result that the indoor levels are not considerably elevated due to the presence of visitors (60–250 visitors per day). In particular, the average PM10 concentrations outdoors (site A) were 48.4 ± 25.5 μg/m3 in Heraklion, 45.5 ± 12.3 μg/m3 in Athens and, 37.8 ± 14.9 μg/m3 in Zagori for the whole time period of 2 years, as shown in Fig. 2. Furthermore, the PM10 mass concentration indoors was higher than the outdoor levels in the Criminology Museum of the University of Athens and the Neophytos Doukas Library in Zagori respectively, which indicates indoor sources such as particle resuspension due to the presence of people inside the museums and poor cleaning conditions. In addition, the indoor concentration in the Historical Museum of Crete in Heraklion was close to the outdoor levels as shown in Fig. 2, which indicates the influence of outdoor PM concentrations (as shown also in Fig. 4). A seasonal variation of the PM10 and PM2.5 concentrations is shown in Fig. 5. The highest indoor concentrations recorded during the autumn and winter periods in the Criminology Museum of the University of Athens (76.5 and 70.5 μg/m3, respectively), whereas comparable high was the average PM concentration in autumn inside the showcase in the Neophytos Doukas Library in Zagori. However, the lowest average concentrations indoors were recorded in the Neophytos Doukas Library in Zagori varying from 28.5 μg/m3 in spring to 47.5 μg/m3 in summer. As shown in Fig. 5, the highest concentrations of particulate matter in the Historical Museum of Crete in Heraklion were recorded during summer and spring (57.5 and 45.0 μg/m3, respectively). The PM10 concentrations outdoors were lower than the Air Quality Standard annual level of 40 μg/m3 (AQS annual level). However, the outdoor concentrations of the PM10 in Athens during the autumn, in Heraklion during autumn and summer and in Zagori during summer were higher than 40 μg/m3 (Fig. 5). The elevated PM10 levels can be attributed to an increased vehicular traffic and other anthropogenic sources in the Athens and Heraklion metropolitan area in agreement with previous studies . In addition, during summer there is an increased traffic in Zagori area from tourists. As mentioned before, the indoor PM10 concentrations were higher than outdoor levels nearly all seasons in all cultural heritage collections due to the presence of people, ventilation conditions and activities indoors. Furthermore, the concentration of PM10 and PM2,5 in showcases shows often similar values with the indoor levels indicating that the use of showcases is not always an effective mechanism for reducing the exposure to particles. Similar results are described also in the section Bioaerosol measurements for the dual role of the showcases in the museums (protective although in some cases result to an enrichment of microbial threats) regarding the protection of the exhibits from viable, cultivable airborne microorganisms with possible degradation capabilities. In addition, higher indoor PM10 concentrations than the AQS level may have an impact also to the soiling risk of exhibits in museums and air quality data may further used for soiling risk studies. The indoor PM10/PM2.5 ratio for the three cultural heritage collections is shown in Fig. 6 for indoor, showcase and outdoor conditions. The highest indoor PM2.5/PM10 ratio is observed in the Criminology Museum of the University of Athens (0.88) and the lowest in the Neophytos Doukas Library in Zagori (0.64). This means that in the case of the Criminology Museum of Athens indoors, fine particles dominate. High PM2.5/PM10 ratios are also observed outdoors which indicate that fine particles are originating outdoors from anthropogenic sources. At the same time higher than one values of the Indoor/Outdoor (I/O) PM10 concentration ratio (as in the case of the two naturally ventilated collections in Athens and Zagori, Table 1) indicate significant indoor sources. Furthermore, the lower PM2.5/PM10 ratio at the Neophytos Doukas Library in Zagori shows the presence of coarse particles mainly from soil resuspension processes. The importance of particle resuspension on PM10 mass concentration indoors has been studied before  concluding that human walking and wind flow can increase considerably the PM10 mass concentration levels. The seasonal variation of the PM10/PM2.5 ratio indoors for the three cultural heritage collections is shown in Table 1. Elevated I/O PM10 values are measured mainly in the Criminology Museum of the University of Athens and the Neophytos Doukas Library in Zagori (2 years average I/O PM10 values 1.38 and 1.12, respectively), which are correlated with high dust load in the collections and resuspension of particles during the presence of people. The Historical Museum of Crete in Heraklion had a mean value of the I/O PM10 ratio close to one (0.98) indicating that there are no significant indoor particle sources. Furthermore, Fig. 4 presents the mean seasonal variation of the infiltration rate of the Historical Museum of Crete in Heraklion versus the I/O PM10. There is a correlation between the infiltration rates with the I/O PM10 values which indicates the influence of the outdoor particle levels in the indoor PM10 concentrations. Higher infiltration rates result to higher I/O PM10 values and therefore to an increased indoor PM10 concentrations. Moreover, the influence of the number of visitors to the indoor mean PM10 concentrations is studied for the Historical Museum of Crete in Heraklion where detailed data are available for the number of visitors as depicted in Fig. 3. The Pearson coefficient for the 2 years measurements is 0.76 which supports the hypothesis of the influence of visitors to the indoor PM10 levels through particle resuspension  and the visitors’ presence . Similarly, the concentrations of the cultivable, airborne heterotrophic bacteria correlated well with the daily visitors numbers showing a Pearson coefficient for the 2 years measurements of 0.75, indicating their anthropogenic origin. In contrast, the cultivable airborne fungi did not show any correlation with the number of visitors, probably, due to their outdoor origin. These results coincide well with the Indoor/Outdoor ratios of the viable, cultivable airborne heterotrophic bacteria and fungi, which are presented and discussed in the section Bioaerosol measurements. Figure 7 presents the PM1 particle number concentration (particles/cm3) in the three cultural heritage collections for the 2 years measurement period. The mean number concentration indoors in the Historical Museum of Crete in Heraklion and the Criminology Museum of the University of Athens show higher concentrations (mean value of 10,000 particles/cm3) in all three sites compared to the Neophytos Doukas Library (mean value of 2000 particles/cm3). The high particle number concentrations are due to the high anthropogenic emissions in the urban areas of Athens and Heraklion compared to the Zagori, which is located in a mountainous region. Similar results were observed in the Baroque Library Hall in Prague, which is also located in an urban setting . The indoor number particle concentrations is higher compared to the outdoor levels in both Athens and Heraklion museums for all seasons except the winter period in Athens metropolitan area indicating indoor sources. The higher levels of outdoor particle number concentration during the winter period are due to heating and elevated vehicular traffic. The higher indoor PM1 particle concentrations are encountered mainly during winter, summer and autumn periods which are associated with an increased number of visitors in the Historical Museum of Crete and the use of the museum cafeteria, as well as, due to elevated outdoor particle levels. Furthermore, the lowest PM1 number concentration values were measured in the Neophytos Doukas Library (mean concentrations of particles 2036 ± 465 particles/cm3 outdoors, 1598 ± 362 particles/cm3 indoors, and 1545 ± 428 particles/cm3 in showcases). The higher PM1 number concentration outdoors was encountered during winter. No significant seasonal trend is observed for the other seasons in the outdoor particle concentrations for Historical Museum of Crete and Neophytos Doukas Library, whereas for the Criminology Museum of the University of Athens lower values are observed in the summer associated mainly with a vehicular traffic decrease due to summer holiday period and reduction of the anthropogenic activities. In addition, the particle number concentration inside the showcases shows comparable values with the indoor concentrations indicating that showcases do not present an effective means for reducing the particle number concentration. Figure 8 presents the measured seasonal variation of viable, cultivable airborne microbes in the three cultural heritage collections during the 2 years measurement period. As shown, high seasonal variability of airborne microbial concentrations was measured. The lowest concentrations of cultivable, airborne microorganisms were determined in the Historical Museum of Crete (average 2 years sum indoors 2292 ± 795 CFU/m3; showcase 1677 ± 834 CFU/m3; outdoors 690 ± 379 CFU/m3), whereas the highest concentrations were measured in the Neophytos Doukas Library of Zagori (average 2 years sum indoors 7310 ± 4,575 CFU/m3; showcase 4168 ± 1201 CFU/m3; outdoors 1266 ± 954 CFU/m3). The cultivable bioaerosol concentrations showed the highest values in autumn indoors (average 2 years autumn sum indoors varied from 3293 to 5093 CFU/m3). In comparison, the lowest concentrations of cultivable airborne bacteria were observed in winter (average 2 years winter sum indoors varied from 680 to 1375 CFU/m3). Extremely high concentrations of cultivable, airborne fungi were measured during winter inside the Neophytos Doukas Library of Zagori (average 2 years winter concentration of airborne fungi indoors 13,283 CFU/m3), where the microclimate was not controlled,and the average winter relative humidity varied from 65.5 to 70.3 % and the average winter temperature from 2.2 to 13.9 °C indoors. The 2 years average indoor/outdoor and showcase/outdoor ratios of the airborne microbes is shown in Fig. 9. As reported before , the I/O bioaerosol concentration ratio is an important parameter for the evaluation of biological pollution indoors. I/O ratios between 1.5 and 2 indicate indoor environment of regular conditions, whereas I/O ratios higher 2 indicate not proper indoor environmental conditions . As shown in Figs. 8 and 9, the indoor concentrations of the cultivable airborne bacteria were higher than outdoors. In contrast, relatively low concentrations of airborne fungi were measured indoors and inside the showcases. Exception was the high indoor fungal concentration in the naturally ventilated Neophytos Doukas Library of Zagori during the winter period. As regards the airborne fungi, the I/O and the showcase/outdoor ratios in the Historical Museum of Crete as well as the showcase/outdoor ratio in the Criminology Museum were under 1 (0.5–0.7), indicating very good storage conditions. Most of the airborne fungi come from the outdoor environment. In contrast, the 2 years average I/O ratio and the showcase/outdoor ratio in the Neophytos Doukas Library of Zagori were extremely high (53 and 5.8, respectively), indicating wall damping, stagnation of water and poor cleaning conditions. Regarding the airborne bacteria, the 2 years average I/O ratios in all three collections were very high varying from 6.4 to 38.1, signalizing the enrichment of opportunistic pathogenic heterotrophic bacteria, cellulose metabolizing bacteria, and acid producing bacteria inside the two museums and the library. The most abundant bacteria in all three collections were the cellulose metabolizing bacteria, followed by the heterotrophic bacteria. The highest concentrations of the cellulose metabolizing bacteria were measured in the Neophytos Doukas Library of Zagori, where damages of the exhibited books are visible. An enrichment of airborne bacteria inside the showcases was also observed indicating that showcases offer not enough protection for specific cultivable, airborne bacteria and fungi (compare in Fig. 9 the enrichment of heterotrophic bacteria during autumn in the closed showcase in the Criminology Museum of the University of Athens). Similarly to PM, showcases can only partly protect the artworks from high concentrations of airborne microorganisms with possible degradation capabilities and acid production. Especially, measurements showed that the 2 years average showcase/outdoor ratio of the acid producing bacteria was 2.2 times higher than the Ι/Ο in the Historical Museum of Crete. Similarly, the showcase/outdoor ratio of opportunistic pathogenic heterotrophic bacteria was 2.3 times higher than the Ι/Ο ratio in the Criminology Museum of the University of Athens, whereas the showcase/outdoor ratio of the cellulose metabolizing bacteria was in the same range like the I/O ratio of the Neophytos Doukas Library in Zagori (Fig. 9). These findings lead to the suggestion that the elevated concentrations of the museum-specific, cultivable, airborne bacteria that were enriched inside the showcases, probably, can utilize the exhibits’ materials as sources for growth. It must be mentioned, that the choice of specific selective or non-selective microbiological growth medium, the incubation temperature and the cultivation time result to differences on the selection of the viable, cultivable, airborne microbial community. Furthermore, the exact microbial concentration cannot be determined using only cultivation dependent methods since microbes may be viable but non-cultivable and culturing usually leads to underestimation of microbial diversity and concentration [22–26]. Nevertheless, the combination of culture-based analysis with molecular analysis increases the observed bacterial diversity. In a former study , we have shown that PM10 mass and PM1 number concentrations, relative humidity and UV radiation play a significant role in the prediction of the viable, cultivable fungal concentration in the outdoor air under specific limitations at the coastal Mediterranean city of Chania in Crete. In addition, recently Skόra et al. have found a correlation between microclimatic conditions (temperature and relative humidity) and concentrations of cultivable, airborne heterotrophic bacteria and fungi in museums, archives and libraries, where the types and levels of cultivable airborne microbes were institution depended. Similarly, in the present study, we have measured “collection specific” enrichment of cultivable, airborne microbes indoors and inside the showcases. However, no significant correlation between the cultivable airborne microbes, the microclimatic conditions and the PM concentrations was found indoors or inside the showcases (Pearson coefficient less than 0.6). Exceptionally, a moderate correlation between the cultivable airborne heterotrophic bacteria and the PM1 number concentrations was found indoors and outdoors only in the Neophytos Doukas Library in Zagori with Pearson r coefficient 0.82 and 0.83, respectively. The non significant correlation among microorganisms and PM may be explained by the fact that the PM and the airborne microbial concentrations showed different seasonal variability both indoors and outdoors in the two museums and the library. Finally, as shown in Fig. 9, the best conditions were observed in the Historical Museum of Crete due to the regulation of the museum microclimate and the proper controlled storage conditions , although this museum receives a large number of visitors. In contrast, the worst conditions were measured in natural ventilated Neophytos Doukas Library in Zagori. From the measurements performed in the current study it can be concluded that in respect to the chemical composition and conservation of the exhibits it is possible that the indoor environment of the museums and of the showcases can result in the enrichment of microorganisms which can attack and partly deteriorate the exhibits. Well controlled microclimatic conditions were measured in the Historical Museum of Crete. In contrast, was no significant differentiation of the indoor, and showcases microclimate as well as outdoor conditions in the natural ventilated Criminology Museum of the University of Athens and the Neophytos Doukas Library in Zagori. The particulate matter measurements in the two museums and a library showed a considerable variability which is related to the outdoor concentration levels, indoor environmental conditions, infiltration rates and indoor activities such as the number of visitors. The lowest 2 years average particulate matter concentrations were observed at the Neophytos Doukas Library in Zagori, which is located in a mountainous region at the north west of the Greek mainland, whereas the highest particle levels are observed in the Criminology Museum of the University of Athens. The 2 years average PM2.5 fraction in the PM10 mass is ranging from 0.9 to 0.74 in the indoor and outdoor sampling sites indicating also that particles indoors have a significant outdoor origin. The average PM10 mass concentration and the PM1 number concentration indoors were higher than the outdoor levels for all three museums. This finding indicates that the presence of visitors in the museums and other indoor activities contribute to higher PM10 mass concentrations also through particle resuspension. In addition, high PM1 particle number concentration were measured in the Historical Museum of Crete and the Criminology Museum in Athens which are located in urban areas due to the high anthropogenic emissions. High seasonal variability of the concentrations of cultivable, airborne microorganisms was measured in the museums. In comparison, the lowest concentrations of cultivable, airborne microorganisms were measured in the Historical Museum of Crete in Heraklion. In contrast, the highest concentrations of airborne fungi were measured in the Neophytos Doukas library in Zagori, whereas the highest concentrations of airborne, opportunistic pathogenic, heterotrophic bacteria were measured in the Criminology Museum of the University of Athens. Occasionally, extremely high concentrations of fungi (during winter indoors in the Neophytos Doukas Library in Zagori) and heterotrophic bacteria (during autumn inside the showcases in the Criminology Museum of the University of Athens) were encountered. Although, the particulate matter correlate well with number of visitors, did not show any significant correlation with the cultivable airborne microbes, and presented a different seasonal variability versus microorganism both indoors and outdoors. Showcases offer not always a protection for PM and specific airborne bacteria. In contrast, an enrichment of viable, cultivable airborne bacteria inside the showcases was observed in some cases that may be related to a possible utilization of the exhibits materials as sources for growth. On the other hand, although the closed showcases of the two museums could only protect the exhibits to a low percentage (8.7–9.4 %) from airborne bacteria and fungi, the concentrations of airborne microbes in the closed showcases of the Neophytos Doukas Library were 56.3 % reduced, indicating the importance of closed showcases, especially in museums with no microclimatic management. An appropriate management of the museums microclimate according the ISO 11799, 2003 , in accordance to proper cleaning, regular dusting, disinfecting, and disinfestating of the rooms, is the best practice to protect the exhibits, and the health of people who consult them or work in them. ML conceived the study for particulate matter measurements and made substantial contribution to conception and manuscript writing. EK conceived the study for microorganisms in air and made substantial contribution to the management of the measurement campaigns and manuscript writing. IK performed the field work for particulate matter and environmental parameters. LR performed the field work for the microorganisms in air. GP managed the study and made substantial contributions to study design. All authors read and approved the manuscript. This research has been co-financed by the European Union (European Social Fund—ESF) and Greek National Funds through the Operational Program “Education and Lifelong Learning” of the National Strategic Reference Framework (NSRF)—Research Funding Program THALES (project INVENVORG contract No. MIS 376986). Leibniz Institute DSMZ—German Collection of Microorganisms and Cell Cultures, 2012. 457. Mineral Medium (Brunner) [http://www.dsmz.de/microorganisms/medium/pdf/DSMZ_Medium457.pdf]. Leibniz Institute DSMZ—German Collection of Microorganisms and Cell Cultures, 2007. 105. Gluconobacter oxydans Medium [http://www.dsmz.de/microorganisms/medium/pdf/DSMZ_Medium105.pdf].